The rally, set for Sunday on the one-year anniversary of the deadly “Unite the Right” rally in Charlottesville, Virginia, has been branded a “white civil rights” protest, but is being put on by Kessler, who organized the neo-Nazis, racists, white supremacists and white nationalists in what became a violent gathering that saw three people killed. While the racist "alt-right" treated the 2017 rally in Kessler’s hometown as a coming out party in the wake of Donald Trump’s win in the presidential election, the anniversary gathering in Washington, D.C., in Lafayette Square Park on the doorstep of the White House is proving a much tougher ticket for Kessler to sell. Many major players in the first rally — alt-right golden boy Richard Spencer, the League of the South, Radical Agenda podcaster Christopher Cantwell and multiple militia groups — have all very publicly distanced themselves from Kessler and the idea of a second rally. “As I’ve stated before, I will *not* be participating in the Unite The Right 2 rally. (I’ll, of course, *consider* any good-faith offer for an appearance, as I did Kessler’s. But I’ve already made my decision clear on many occasions now. ),” Spencer tweeted on August 5. Alt-right frontman Richard Spencer tweeted on Aug. 5 that he wouldn't take part in a "Unite the Right 2" rally in Washington, D.C.,organized by Jason Kessler. The first rally devolved into a series of fights. Three people were killed at the 2017 gathering in Charlottesville, Virginia. With a lack of public big names willing to attend and Kessler’s pariah status among his fellow racists and in his hometown, a second rally is shrouded in uncertainty as to who will attend, how many people will show up and will 2018 be as big a disaster as 2017. After losing a bid for a permit to hold the anniversary rally in Charlottesville (and later dropping a lawsuit over the issue), Kessler has been quiet about who will be speaking at the Washington, D.C., rally. According to leaked Facebook chats, Kessler's wish list for speakers included neo-Nazi Congressional candidate Paul Nehlen of Wisconsin and David Duke, the grandfather of the modern racist movement and well-known publicity hound. Neither have committed to speaking at the rally. On Twitter, Kessler is promising a human rights activist from South Africa, an Iraq War veteran and various other activists in the nation’s capital but won’t name names. “I’m not releasing the names of speakers because I don’t want them subject to harassment,” Kessler wrote in a since-deleted tweet on August 6. "Unite the Right 2" organizer Jason Kessler has posted to Twitter and the alt-right social media site Gab that he won't reveal who is expected to speak at his rally on Aug. 12 in Washington, D.C.
Kessler was also unable to give an estimate of how many people might show up at his proposed gathering in 2018. Kessler did not return an email from the Southern Poverty Law Center with questions about the rally. In some ways, it is easier to peg who won’t be in Washington, D.C., and what won’t happen at Kessler’s rally than who will be there and a schedule of what will take place. Kessler has called for neo-Nazis, white supremacists and militias to stay away. It’s one of the few things he’s found agreement on with participants from last year. On Gab, a social media site favored by the alt-right, racists and neo-Nazi crowd, there’s massive skepticism about "Unite the Right 2." Andrew Anglin, who runs the neo-Nazi blog the Daily Stormer, has called for his readers and followers to avoid Kessler’s rally. In a long blog post on August 5, Anglin said street marches aren’t the answer and don’t have the effect people like Kessler want them to have. Instead, Anglin wrote, they create “bad optics” for the alt-right and neo-Nazis. 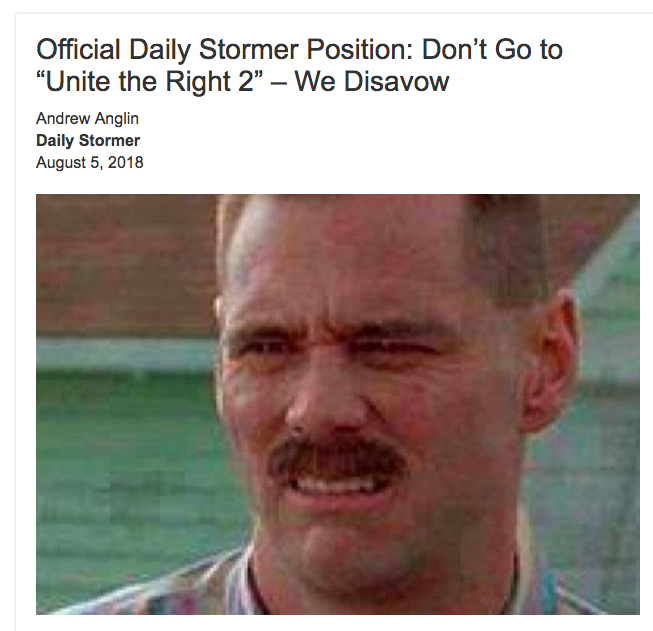 The neo-Nazi website the Daily Stormer and the primary blogger Andrew Anglin have asked followers to stay away from Jason Kessler's "Unite the Right 2" rally in Washington, D.C. on Aug. 12. "These post-Charlottesville marches have no purpose, other than to make anyone who supports white self-determination look like a fringe lunatic. They are horribly destructive, and they need to stop," Anglin wrote on Aug. 5. The denunciation is the latest sign of discord on the far right after the 2017 "Unite the Right" rally in Charlottesville, Virginia devolved into violent conflicts and ended with three people being killed. Unlike the 2017 rally, which featured a torch-lit march at the University of Virginia with white nationalist and white supremacists chanting “Jews will not replace us,” there will be no fire this time for Kessler and his crew. The National Park Service doesn’t allow fires at Lafayette Square Park, which could leave some of Kessler’s crew in the dark. Despite suggestions in leaked Facebook messages, there seems to be no cohesive plan for any imitation of the torch-lit rally. “No fire allowed. We need to forget about the torch thing,” Kessler wrote in a leaked Facebook message on May 23. But, there will be counter-protests. Nearly two dozen organizers from groups including Black Lives Matter Charlottesville, Black Lives Matter D.C., Maryland Antifa, the D.C. Antifascist Collective and the Frederick Socialists are planning a mass counter-protest, according to DCist. The demonstration is called Shut It Down D.C., which will go on for the entire weekend. “This is for Heather Heyer, ICE abolition, open borders, dismantling the prison industrial complex, and ending the settler colonial system. We will confront fascism, antisemitism, Islamophobia, white supremacy, and state violence on August 10-12,” reads the counter-protest’s website. As for Charlottesville, the city is planning multiple activities along the downtown mall and near the park housing the statue of Confederate General Robert E. Lee, which was the epicenter of the 2017 violence. The idea, officials have said, is to promote peace and take back the weekend and image and narrative about the city of 48,000 from the events of 2017. It is unknown if Kessler or any of his supporters will try to make a show in the city on the anniversary of the prior year’s riot. Kessler has been mostly silent on any plans for Charlottesville, leaving what may happen there in question. And, a city on edge as the deadly anniversary passes.